Angelika is one of 25 members of the imaginary Pompolini family of Avatars, who are incarnations of higher beings on earth. Avatars deliberately descend into lower realms of existence for special purposes. Each Pompolini has a unique and distinct character, but they all share the same fundamental value; that of being True to themselves and to their calling in life. They intend to inspire us to find our own unique purpose in the world and to seek it with all our might, regardless of the obstacles on our way. Priya was born in Iran in 1977. Her family fled to France and then Canada after the 1979 Iranian revolution. 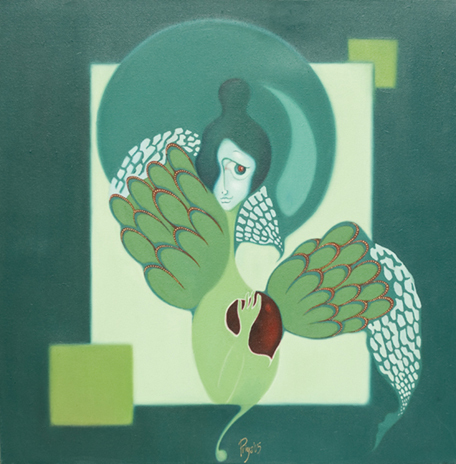 A self-taught artist, and an active member of several organizations for peace and transformation in the world, her artwork is an expression of the Divinity within all human being. 2. Special and autographed edition of SF Poet laureate, Jack Hirschman’s monumental book of poetry, the Arcanes. Touch the Oliso Steam Iron�s handle, and the iron instantaneously lowers onto your ironing. When you let go, special lifters raise the iron safely above the fabric. These lifters disappear into the soleplate when you iron, and won�t snag or burn even the most delicate fabrics. 6. UNESCO-edited specialty books of Mahmoud Farshchian’s book of miniatures. When you or someone in your family is unhappy or upset, meet with a licensed psychotherapist with over 25 years of experience helping adults, couples, children of all ages (from birth through teens), families, and parents. She also offers hypnosis for problems affecting the connection between the mind and body, such as pain or difficulty sleeping. Get serious and make the leap from dreams to reality. This workshop is tailored to writers who have written or are considering writing a book or book proposal and want an in-depth exploration of publishing avenues. Rejuv Anti-Aging Clinics brings the latest technology and experienced medical professionals to you in a casual and relaxed atmosphere. Ecological extra virgin olive oil from the Andalusian mountains, obtained mainly from the Arbequina variety of olive, it is notable for its elegance, freshness and harmony, with an interesting range of fruity flavours, with almond particularly prominent. The smoothness of this ecological extra virgin olive oil brings out the flavours of the foods it accompanies.